Artillery Officer's Cap, Sash, Epaulettes, and Belt of Lieutenant Robert Fletcher, c. late 19th century, Model 1864 artillery officer's cap with red horsehair plume, first artillery insignia and crossed cannons, maker's mark on inside HORSTMANN BRO. 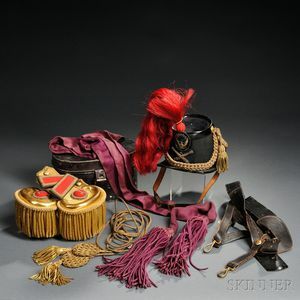 &/ALLIEN,/NEW YORK., bullion braid and tassels on crown, and bullion chest cords, leather officer's belt (missing buckle), maroon officer's sash, artillery lieutenant's shoulder boards, artillery officer's dress epaulettes with gold bullion fringe, circular red insignia with a 1 in the center, and a japaned tin storage case with two artillery buttons and attachment hooks inside. Note: Robert Fletcher received his Lieutenant's commission after his graduation from West Point, and after serving for two years was offered the position as Dean at the newly formed Thayer School of Engineering at Dartmouth College. Cap has some wear from use, belt is missing it's buckle, sash has some light wear and holes, and tin storage case has some minor paint loss.